Bellevue College developed a variety of resources to support you on every step of your educational journey. Below you will find more information on the different areas of Bellevue College student support for students in an Online, Hybrid or a Face-2-Face class on campus. The Library Media Center (LMC) has a great variety of different resources which include books and media, databases, journals and ebooks, and more. The Collaboratory, located on the first floor of the library, is a public use space designed for flexible student collaboration and teamwork. The Collaboratory is primarily a student space, but may be occasionally reserved by faculty and staff for designated activities. For more information, please see our detailed Collaboratory use procedure. Academic Advisors at Bellevue College supports you with fulfilling your educational goals. Academic Success Center provides the following tutoring services: Reading Lab, Writing Lab, Math Lab, and Workshops. If you can’t come on campus, we have eTutoring service available for you. An online tutoring platform allows tutors to work with you synchronously and asynchronously. 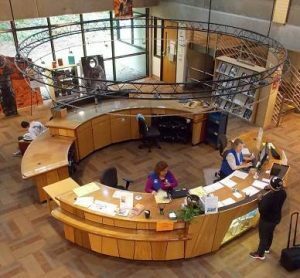 The Disability Resource Center (DRC) at Bellevue College is fostering transformational change to present disability as a valued part of life. DRC provides a wide variety of accommodation services for students with documented disabilities. Counselors can assist you with a wide variety of personal life challenges or any other concerns that may be impacting your academic performance. The Counseling Center provides the following services: Personal Canceling, Group Counseling, Career Counseling, and Educational Counseling. The Financial Aid Office can help you with applying for financial aid and checking your application status. Visit the Financial Aid office website for information such as application deadlines and to check your financial aid application status (grants, loans and work study). The Center for Career Connections and Women’s Center has a variety of resources to provide you with the necessary tools to navigate the scholarship process. You will find scholarship opportunities including college scholarships offered through the BC Foundation. At Bellevue College, you can sign up for the automatic tuition payment plan. It is important to note there are quarterly deadlines to sign up for this plan. The Student Central helps you navigate around Bellevue College and provides answers to the questions about all the available departments and services on campus. Online services include the following useful links and information: Popular Resources, Registration, and Registrar’s Forms, Records and Grades, and Student Accounts. The Center For Career Connections provides comprehensive career resources for all stages of your academic and professional career. Career planning can help you match majors to occupations. At Student Programs, leadership and engagement are the keys to your success. By encouraging personal connections and exploration, Student Programs can help become confident world citizens. Explore student organizations, find events and activities and learn about leadership training. At Bellevue College, you can purchase textbooks and more at our BC Bookstore or order them via BC Bookstore website. Bellevue College policies and procedures provide an institutional perspective on many important issues for college management and governance. They also provide a context for action and thoughtful decision making. Bellevue College Technology has a website, with the resources that include information about Bellevue College email, accounts and passwords, computer labs, how to get help with Canvas and more. Canvas is BC’s Learning Management System. If you experience any technical issues with campus technology or Canvas login issues, Information Technology Service Desk is here to support you. Contact information is posted on their website. Evaluation Kit online course evaluations are a quick way to give feedback on your online courses. Evaluations make a difference in helping deans, chairs and faculty enhance course content. FAQs for students on the vendor website. Examity offers live online proctoring by using a webcam to monitor students taking exams online. Examity is used currently in the Health Sciences, Education & Wellness Institute at Bellevue College. Students using Examity should contact their Instructor or the Program Chair for detailed questions. Looking for more information, forms, or links to getting started? Check out the Student Services page. Depending on the type of class you are taking (Online, Hybrid, or On-campus) you may use Canvas extensively or on occasion. It is important that you go through the information below before the first day of class. If you do not follow the steps below ahead of time, it may delay your ability to access course materials on the first day of class. If you need a face to face Canvas workshop information will be listed on the Technology Support Services website. This free, non-credit workshop, held online, before the start of each quarter, over four consecutive half-days, is designed for students who are new to online learning at Bellevue College. Log in anytime each day and complete the assignments that will help you navigate Canvas. Canvas is our online learning management system, where online, hybrid and web enhanced courses are conducted. Advanced registration is required. Experienced online instructors will be facilitating this workshop. Looking for quick Canvas tips? We have a collection of general tips when using Canvas, posted on this site. Looking for more detailed information about Canvas? These tutorials provide lots of information about Canvas navigation, inbox, discussion boards, assignment, calendars, chat, and more. Review the list of browsers that Canvas supports and learn more about basic computer specifications. Checking your BC email is very important! We have resources for you that will help you set up your email and connect it to your mobile device. Cheating, stealing, and plagiarism are violations of the Student Code of Conduct at Bellevue College. Violations could result in a failing grade for a particular assignment, a failing grade for the course, or dismissal from Bellevue College. Online courses in Canvas have Plagiarism detection software, called Turnitin. We have a large collection of library resources and databases for you. Check them out on our Library Media Center website. These tutorials provide information on citing commonly used resources in the APA and MLA styles. The purpose of the Reading Lab is to provide a place where you can practice reading skills, especially reading comprehension, speed, and vocabulary. The purpose of the Writing Lab is to provide a place where you can improve your revision skills. The Math Lab provides free drop-in tutoring if you are currently enrolled in mathematics courses offered by the Bellevue College Mathematics Program. Log in to follow, share, and participate in this community of students, faculty, instructional designers and administrators. Suggest your ideas, get votes from your peers and watch the idea get incorporate as feature in your Canvas environment. The Online Writing Lab (Free Web Resources Purdue OWL) at Purdue University houses free writing resources and instructional material for students and instructors. In this free tutorial you will learn some basic rules of APA style. Khan Academy offers over 3,000 free videos tutorial, covering different subjects. These free tutorials will allow you to become comfortable with technology in no time.